The Bosphorus A stay in İstanbul is not complete without a traditional and unforgettable boat excursion up the Bosphorus, that winding strait that separates Europe and Asia. Its shores offer a delightful mixture of past and present, grand splendor and simple beauty. Modern hotels stand next to yalı (shore-front wooden villas), marble palaces abut rustic stone fortresses, and elegant compounds neighbor small fishing villages. The best way to see the Bosphorus is to board one of the passenger boats that regularly zigzag along the shores. 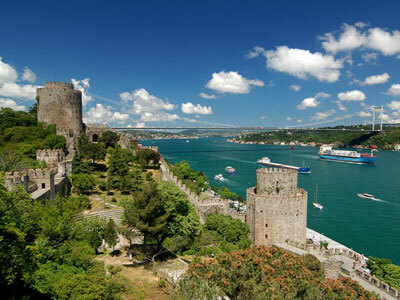 You embark at Eminönü and stop alternately on the Asian and European sides of the strait. The round-trip excursion, very reasonably priced, takes about two hours. During the journey you pass the magnificent Dolmabahçe Palace; farther along rise the green parks and imperial pavilions of the Yıldız Palace. On the coastal edge of the parks stands the Çırağan Palace, refurbished in 1874 by Sultan Abdülaziz, and now restored as a grand hotel. For 300 meters along the Bosphorus shore its ornate marble facades reflect the swiftly moving water. 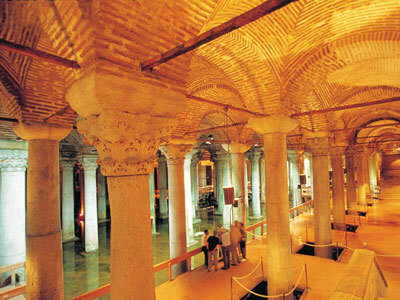 One of the magnificent historical constructions of Istanbul is the Basilica Cistern, located near south-west of Ayasofya (Hagia Sophia). This huge cistern, which was founded by Justinianus I, a Byzantine Empire (527-565), began to be called by the public ‘the Sinking Palace’ – and not without a reason, seeing the great number of marble columns arising out of the water. In place of the cistern was formerly found a great Basilica, which had probably been built in IIIrd or IVth century during the Early Roman Age to be used in commercial and legal affairs and scientific and artistic activities. The basilica was reconstructed by Ilius after it had burned down in a conflagration that broke out in 476. Then it suffered another conflagration. It had a marble statue during the calamitous Nika rebellion in 532 which terrorized the city.It is narrated in former references that there was a garden here, surrounded by a colonnade, which faced Ayasofya. It is also added that there was a bronze statue of the Prophet Solomon in the garden, with his hand on his chin looking in amazement at Ayasofya, which was even more marvellous than his work. The mentioned statue was later removed by the Emperor Basilius I (867-886). As is known, the temple that been erected by the Israeli King, the Prophet, Solomon in Jerusalem in his name had been known as the most magnificent work on earth until Ayasofya was constructed. It is further narrated that the Emperor Basilius had the said statue melted and had his statue erected on the spot. The Emperor Justinianus had this cistern built in 542 on the site of the great basilica that had been destroyed in a conflagration. It is located on the promontory of the historical peninsula in İstanbul which overlooks both the Marmara Sea and the Bosphorus. The walls enclosing the palace grounds, the main gate on the land side and the first buildings were constructed during the time of Fatih Sultan Mehmet (the Conqueror) (1451 - 81). The palace has taken its present layout with the addition of new structures in the later centuries. 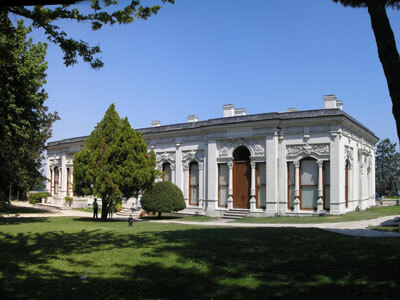 Topkapı Palace was the official residence of the Ottoman Sultans, starting with Fatih Sultan Mehmet until 1856, when Abdülmecid moved to the Dolmabahçe palace, functioned as the administrative center of the state. The Enderun section also gained importance as a school. Hagia Sophia was, for nearly a thousand years, the largest enclosed space in the world, and still seen as one of the world's most important architectural monuments. 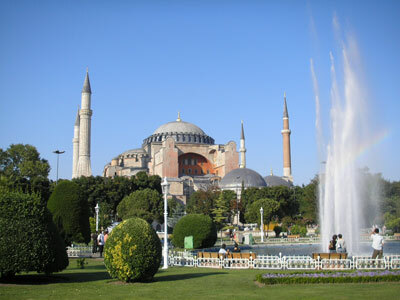 It is one of Turkey's most popular attractions, drawn by the sheer spectacle of its size, architecture, mosaics and art. For 916 years it was a church, then a mosque for 481 years, and since 1935 has been a museum. Thought to have been constructed by Emperor Konstantinos I (324 - 337) it was burned down during a revolt. Rebuilt by Emperor Theodosium II, it was opened for worship in 415 and once again was burned to the ground, during the Nika revolts of 532.Emperor Iustanianus (527 - 565) wanted to construct something even bigger than the original two and appointed architects Isidoros from Miletos, and Anthemios from Tralles to build the Aya Sophia which still stands. Columns, heads, marble and coloured stones were imported to Istanbul from ancient cities in Anatolia for the purpose. The construction began on 23 December 532, and was completed exactly five years later. The main, central section measured 100m x 70m, covered with a 55m high dome which was a mammoth 30m in diameter - appearing to be a great feat of design. The mosaics are of great importance, and the oldest ones are dominated by geometric and plant motifs decorated with gold.